I'm incredibly honoured and flattered. On Saturday night I went to the Voices of 2013 launch in Sydney (grinning from ear-to-ear) and met some of my favourite bloggers and re-connected with others. I hadn't seen Maddie from Colour Me There since high school (what are the chances! ), got to meet Pip from Meet Me At Mike's and Bron (maxabella loves) for the first time, and Cintia from My Poppet who is just as much fun in real life. It was great catching up with Lisa (the red thread), Viv (ish & chi), Lexi (pottymouthmama), Babs (Patchwork Cactus), Susie (Flowerpress), Rebecca (Wee Birdy), and Belinda (The Happy Home). And there were new friends to make too. Ali from At Home With Ali is just about the loveliest person you will ever meet and has an incredible blog full of ideas for being creative with kids. And Alana from HouseGoesHome who is warm, engaging, super-interesting, and just about the best blog writer I have ever met - her site is a hoot! 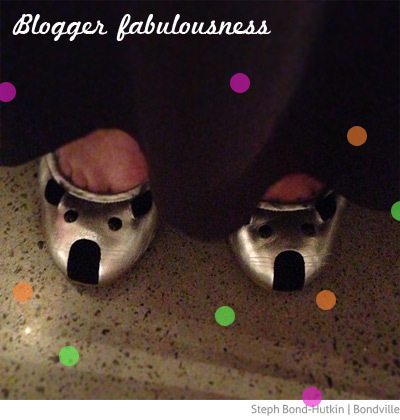 (And she was wearing the Marc Jacobs mouse shoes... and she has just been to a southern wedding in North Carolina... there was too much fabulousness going on). I spent all evening gas-bagging, and not taking photos, but there are lots to see on Instagram and Twitter (#voicesof2013). When Kidspot posts all the photos from the night I will share then with you. The awards program runs all year with some great prizes (including a trip to NYC, writing contracts and Ford cars! ), so I will let you know how it progresses. But seriously, I'm overwhelmed to just be a finalist. Thank you Kidspot, justb., Vogue, Taste.com.au, and sponsors Ford and The Good Guys! Steph - meeting you was one of the highlights of my night! Thx for the kind words. I am a new Bondville convert, such a gorgeous blog. Congratulations Steph - you thoroughly deserve being there.